What are your most time demanding tasks as a mother? For me, it’s shopping and errands, cleaning, and taking care of tasks around the home. These repetitive weekly tasks can become overwhelming if we get behind. I want to share with you my favorite 3 ways that I simplify my own mom chores — and how you can, too! 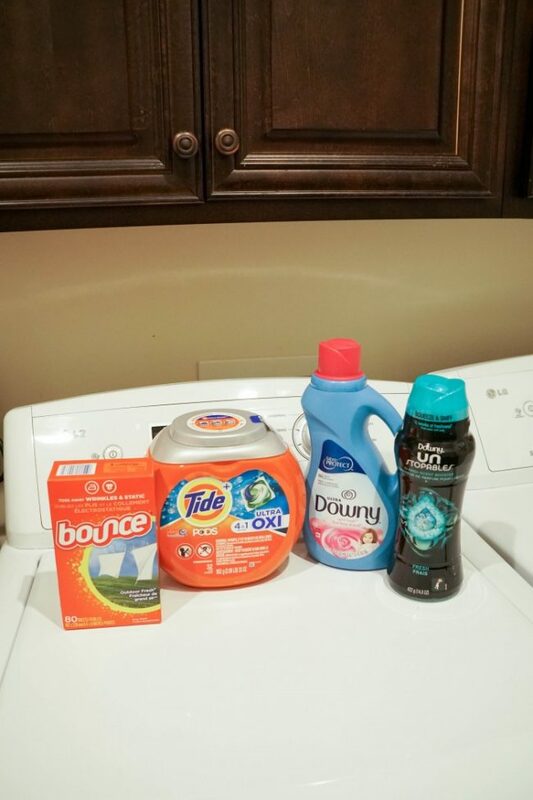 This is a sponsored post written by me on behalf of Tide, Downy, and Bounce available at Walmart. The opinions and text are all mine. As a busy mom of 4 boys, I don’t have any extra time to waste!! My favorite way to simplify my responsibilities as a mother is ordering my groceries and other household goods for pick-up. I easily save an hour by shopping online (or through the app). I’m a big fan of Walmart’s Grocery Pickup service. I can order all the groceries and household products I need, and even those extras I remember I need last minute! It takes just a little pre-planning, but it’s worth the little effort for a huge time and energy savings (not to mention I always save money by not splurging on those impulse buys at the checkout line). I order groceries once a week and keep a regular schedule that makes picking-up groceries a part of my routine. I add my routine products to my favorites list to make reordering easy. With Walmart Grocery Pickup, I can shop recent items and recurring favorites to make it so quick to order all of our typical groceries. 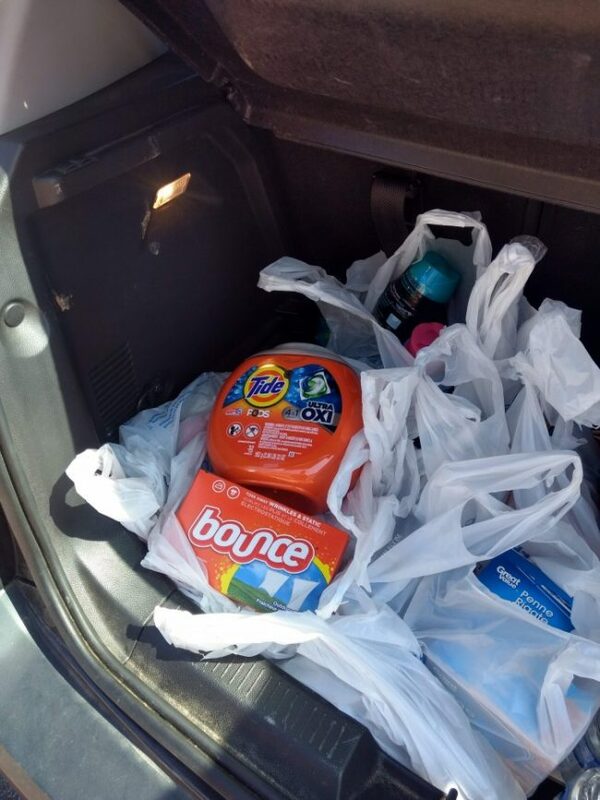 I love to add all of our laundry care products and other household needs and not have to lug those containers all around the store or even to my car. A Walmart associate quickly and efficiently loads all my items right into my trunk. All I have to do is sign receipt of the order and they do the rest. This helps so much to save me time and I love that I don’t have to pull my kids through the store. We stop for our Walmart Grocery Pickup and then we’re back on the road and on our way home. With summer quickly coming up, I know this is going to be a lifesaver for me to be able to tackle this one important mom chore without fuss or worry! 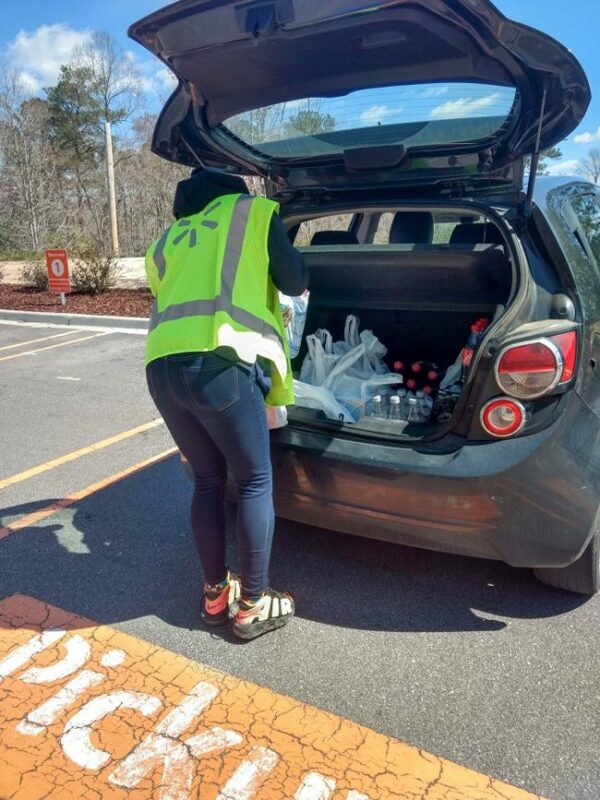 You can take advantage of Walmart Grocery Pickup at grocery.walmart.com or download the Walmart Grocery app! Then, just search for your favorite products, including my laundry care recommendations below, while you shop. Then select a pickup time that works for you and check out. One bonus trick — you can add things you forgot up until the day before your pickup time! Putting things away can absorb a ton of extra time. Family members are likely not going to go through any extra effort to put things away if it’s not easy and convenient to do so. One inventive, but simple, change we made in our home was putting my boys clothes dresser right into our laundry room. It makes it a cinch for all the dirty clothes to go right into the laundry basket, which is also in the laundry room. It completely eliminates the task of taking dirty clothes from their rooms and returning clean clothes back to dressers inside my boys’ rooms. This is an absolutely huge time saver for our family! 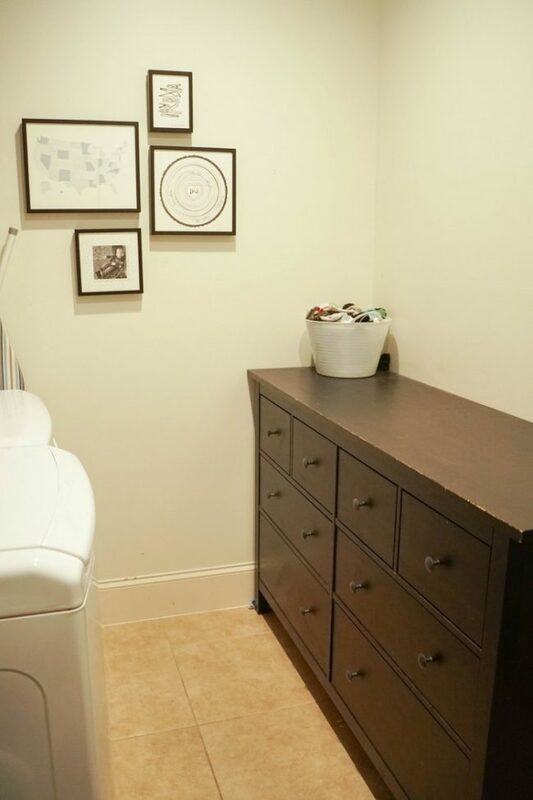 The kids change in the laundry room or bathroom that’s right outside the laundry room. My oldest son, who’s 12, just recently went back to storing his own clothes in his room and was ready to take on the responsibility of doing his own laundry full time. My younger boys that are 10, 8, and 4 keep their clothes stored in the laundry room. As another example, I also store a collapsible laundry basket right between the washer and the laundry room cabinets. 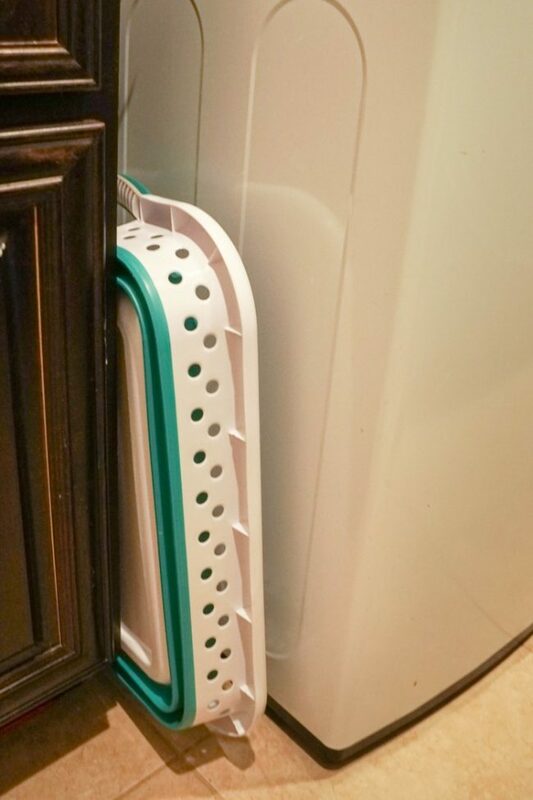 This keeps it out of the way when not needed but really easy to grab and use when emptying the dryer or sorting clothing. Cut out extra steps from your routine wherever you can find the opportunity. The easiest mom secret I have is to forget folding your kids’ clothes! I used to spend so much time folding and organizing for perfectly neat drawers. But my children just quickly disorganized them and tossed about their clothes. 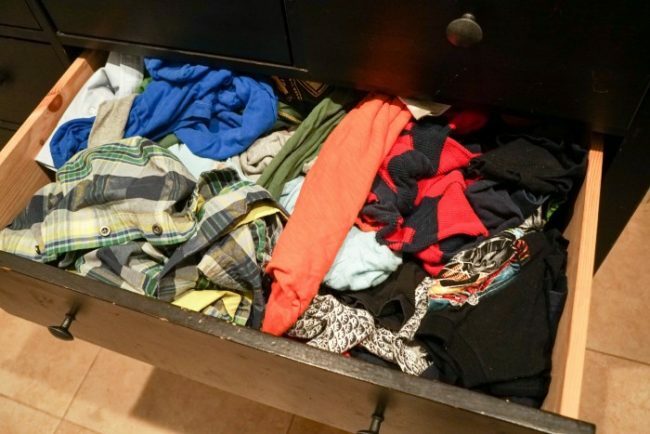 It’s a really big time saver to be able to open up their dresser drawer and toss in all their tops in one drawer, then all the bottoms in the next, and call it a day! If it doesn’t bother you — or them — then don’t spend extra efforts where they aren’t needed. Another way I streamline is by tackling all my laundry loads on one day of the week. That means I’m not stuck thinking about laundry every day or have a task looming overhead. I set up a day of the week when I’ll be home most of the day (for me that’s Thursday) and plan to do back-to-back loads until all of the laundry has been washed, dried and put away. Since laundry is on my mind all day and I know there’s another load coming up next, they don’t accidentally get left in the washer or dryer. Keeping up a regular schedule also means there’s less to think about and plan for. One of my favorite secrets for streamlining my laundry efforts is Tide PODS OXI! 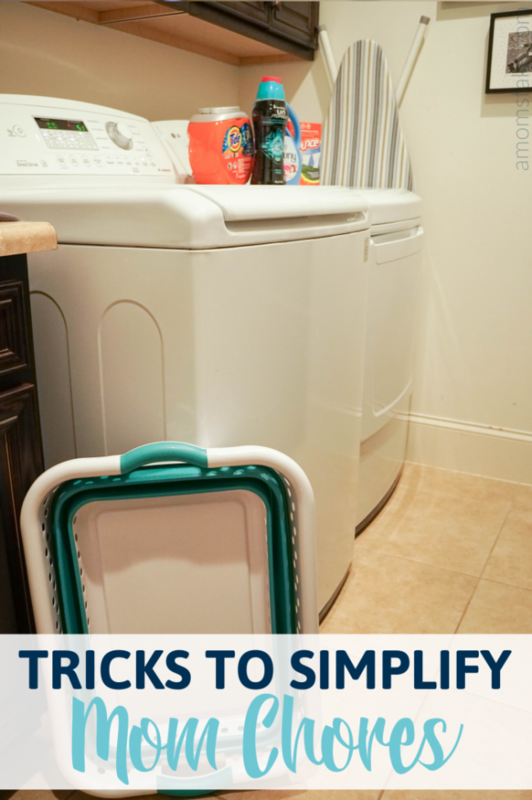 They are so easy to use and really help make my laundry routine a cinch. The new and improved Tide PODS offer a 4-in-1 laundry solution that includes concentrated Tide detergent, extra odor fighters, extra stain fighters, and built-in pre-treaters. I love that I can skip the extra steps with this one product! I finish off my laundry routine with a couple other products to complete the entire laundry routine. My very favorite thing to add to the wash cycle are Downy Unstopables. They smell amazing and keep my clothes smelling fantastic for up to 12 weeks of freshness. You can also add Downy Liquid Fabric Conditioner to the wash cycle to help protect and condition your clothing to keep them looking new longer. 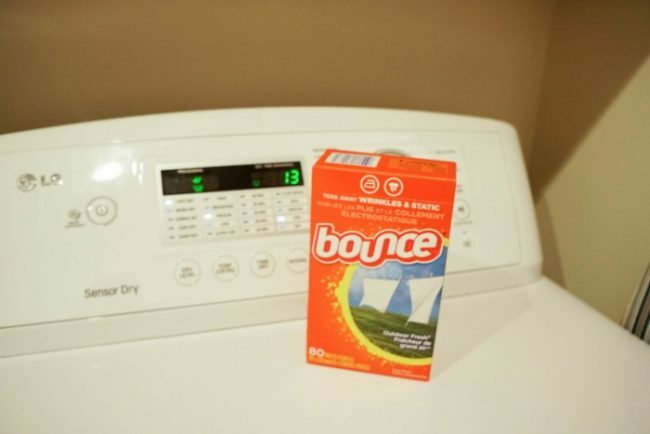 I finish with a Bounce dryer sheet to avoid wrinkles and static while finishing my wash routine. 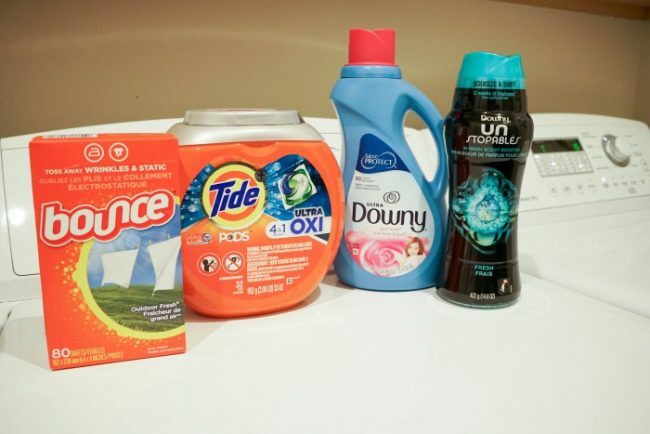 You can add all four of these great laundry care products to your next Walmart Grocery Pickup order by clicking here! In one click, you’ll be able to easily add my favorites to your cart, and then customize your order to fit your family’s needs. What tricks do you have for making your mom chores and responsibilities easier? Previous Post: « Wonder Park (in Theaters Friday) Roller Coaster with Straws! I need all the help I can get. Grocery pick up helps cut my errand time in half. It’s so amazing that grocery pickup exists now! There are many days where that is a life-saver. Great tips!